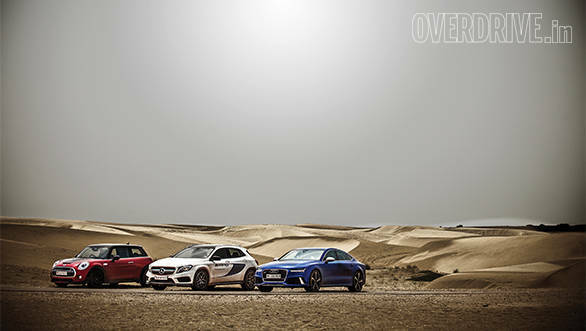 An RS 7, a Mini Cooper S, a GLA 45 AMG. . . 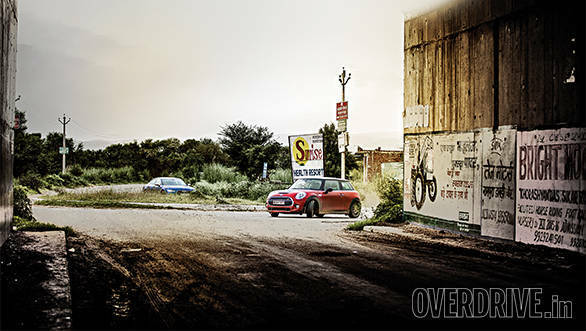 In 2007, OVERDRIVE wanted to celebrate the fast roads of Rajasthan with the quickest cars they could get their hands on. Back then, that meant limousines from the big three  the Audi A8, the Mercedes-Benz S-Class and the BMW 7 Series. Fast forward to 2015, and there's an abundance of ludicrously fast cars cutting all shapes and sizes to choose from. And that's how the idea for this story materialised. We wanted to relive the excitement from eight years ago and drive down the same roads with three cars from the same manufacturers, but with one small twist. This time, we'd take three of the most unique machines they make. Barely 20km down the road and I'm already regretting that decision. We left Gurgaon way before sunrise, hoping to escape the nasty jams at Manesar. But we encountered a different horror instead. Thousands upon thousands of devotees had blocked the highway, celebrating a festival where they run with water collected from the Ganga at Haridwar to their various villages in Haryana. While these barefoot devotees seemingly relay race each other, their companions surround them in overloaded trucks with blaring music. Simultaneously, hundreds of them weave dangerously through the jammed traffic on horrendously loud, de-exhausted motorcycles. The entire swarm seemed intoxicated with religious fever and probably something much more potent. 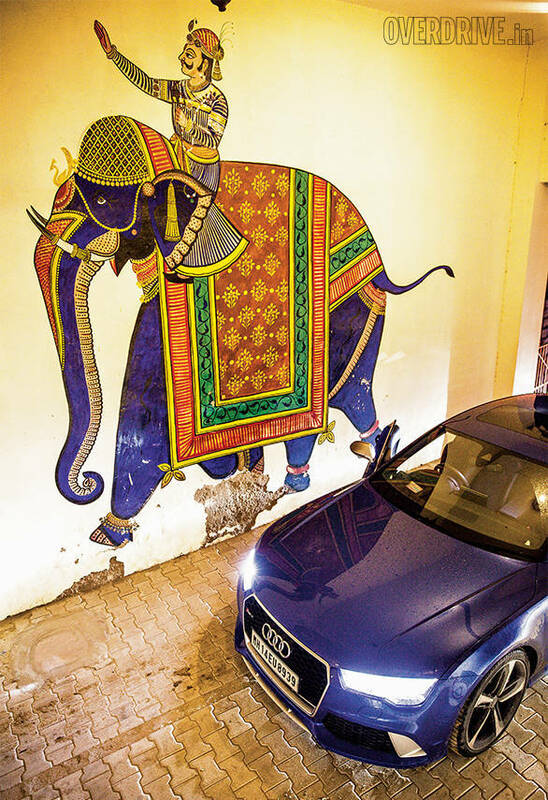 In the attention grabbing and near Rs 1.7 crore (on-road Delhi) Audi RS 7, the experience was terrifying  parking sensors beeping themselves hoarse as I tried keeping as much distance from these stick wielding, wildly shrieking men of God. Inevitably, I accepted the situation  off went the sensors and up went the audio on the fantastic 1220 watt Bang and Olufsen system. The big Audi immediately cocooned me from the chaos outside, allowing me to soothe my frayed nerves. In a strange twist, my first encounter with what I expected to be an intimidating, firebreathing beast turned out to be protective and calming. Two hours and 40 agonising kilometres later, the roads widened and devotees faded away. Finally, the moment I was anticipating for days had arrived. Sport mode, engaged! It's a bit a of a shock to the system, feeling an RS 7 accelerate flat out for the first time. I've driven the M5 and E 63 AMG before  both similarly powerful cars. But they are rear wheel drive and spend half their lives in an entertaining battle with traction control as they endlessly attempt to shred their rear tyres. The all-wheel drive RS 7 is different. It simply launches you ahead, in a drama free but physically violent burst of speed. Gear after gear, the turbocharged 560PS V8 hammers you down the road at warp speed with a deep roar from the exhausts. It won't relent until you call it quits, and with a top speed that hovers around 300kmph this is not a car you can play chicken with. Before I land in some serious trouble, I back off  we've still got over 1,500km to go. Switching the RS 7 back to Comfort mode produces an unusual sensation - the entire car seemingly lets out a sigh as its muscles relax and it settles down into a softer persona. 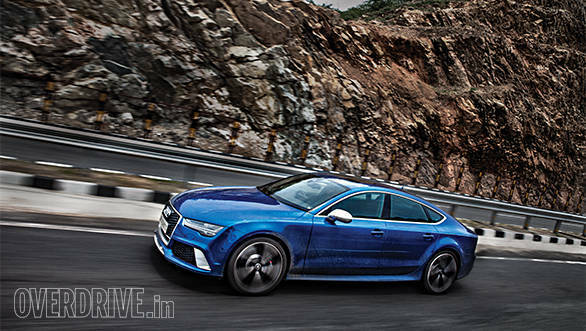 In this guise, the RS 7 turns into a brilliant tourer with a surprisingly plush ride on good roads. Settle below 2,500rpm, still about 150kmph in eighth gear, and the engine goes silent as Audi's cylinder deactivation tech attempts to save fuel by cutting off four of the eight cylinders. Super car performance, luxury car comfort with four seats and a boot. And that exquisite derriere. What an astonishing machine! With my head slowly recovering from the RS 7's manic turn of speed, I realise something. This gorgeous fastback has a smaller engine than the 330PS 4.2-litre V8 from the A8 we drove all those years back. Smaller yes, but it makes it makes a nearly unfathomable 70 per cent more power. Even the Mercedes-Benz GLA 45 AMG, with its heavily turbocharged 2.0-litre four banger makes 30PS more than the A8. Progress is swift and relentless. Quite like the little Mini Cooper S we have here. Yes it's a bit of a cheat, but Mini is owned by BMW and the new Cooper is such a joy that we absolutely had to have it on this drive. So here we were, this motley crew of machines, headed in search of the fabled fast and deserted roads of Rajasthan. Our destination for the day was the Jhalamand Garh, a beautiful heritage hotel just outside Jodhpur, about 600km from Delhi. I budgeted a whole day for the drive, but these machines had a ravenous appetite for miles, covering huge distances with complete ease. We made excellent time, despite a slow and scarred road connecting the last 150km stretch from Beawar to Jodhpur. By 4pm, we were checked in and the helpful staff at the hotel served up a delicious, home-style Rajasthani lunch of laal maas, a spicy red mutton gravy and daal with rotis and rice. Heavy food and the Rajasthani heat meant a nap was inevitable and we woke up just in time for a second round at dinner! More mutton demanded more sleep but we couldn't just yet, the cars needed fuel too.t the very least so we set out to find some. After being turned away by numerous stations, we finally resorted to Just Dial who put us in touch with a pump in the city that claimed to have the good stuff. It took a bit of a hunt, with Google taking us through some broken and even flooded streets but we finally found the pump. It was a nail biter in the RS 7 but we soon realised that ground clearance wasn't this car's problem, protecting its delicate rims and tyres was. This RS 7 runs massive, optional 21-inch wheels wrapped with what would best be described as rubber bands. Granted they look excellent parked outside the club, but such low profile tyres are a pain to manage and simply don't work in the real world. The next morning, I swapped the Audi RS 7 with Shumi for the Mercedes-Benz GLA and instantly discovered a completely different animal. Where the Audi RS 7 surprised with its ability to switch from ballistic to docile, the Mercedes GLA 45 AMG thinks that you've paid its Rs 85 lakh asking price just to go racing. Everything is pumped up to 11 in the AMG. The cabin is loud, the quad exhausts belt out a blaring braap no matter the speed and there's no sympathy from the suspension. Even the seats with their hard backs feel like they've been lifted off a rally car. Strange then, that the SUV with the highest ground clearance has the hardest ride and feels the most focussed. 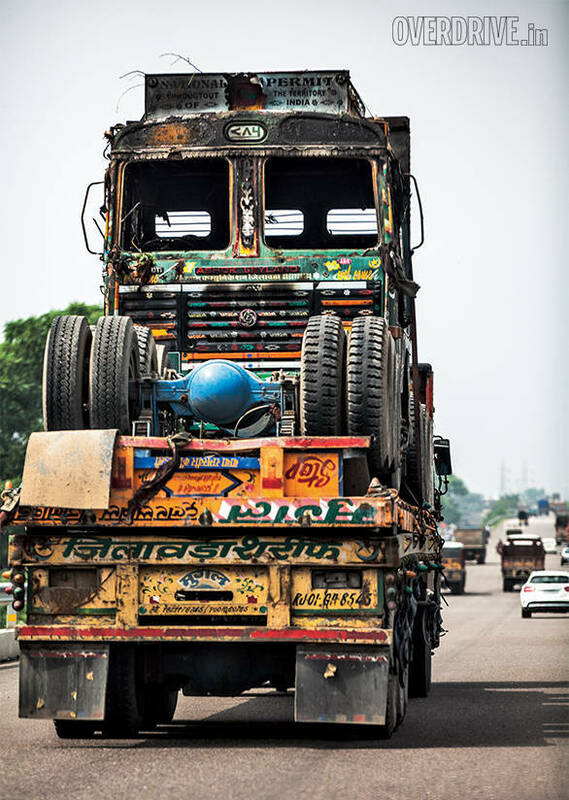 The bumpy drive into Jodhpur raised some concern about what kind of roads lay ahead. But as we passed Pokhran the next morning and on to the NH15, I knew we'd arrived. The traffic vanished and we found ourselves alone on a beautifully smooth road that stretched to the horizon, snaking through what was otherwise wild desert wasteland. Think fast roads, and a multilane monstrosity comes to mind. But here was a simple, two lane highway that could sustain more speed than any other Indian road I've been on. Interior Rajasthan has the most cattle I have ever seen, but here in the wilderness, the roads were bovine free and visibility was excellent. Best of all, there was not a speed limit board to be seen all day. These are the kinds of roads you can go as fast as you dare or simply settle into a high speed cruise, dispatching huge distances with complete ease. The only reason these roads exist is to support rapid transport of troops and artillery to the border. Thankfully, the only thing heading towards the border at speed today are three loud sportscars. On roads like these, it takes a while to understand what the GLA is about. At first, it feels a little unnecessary. 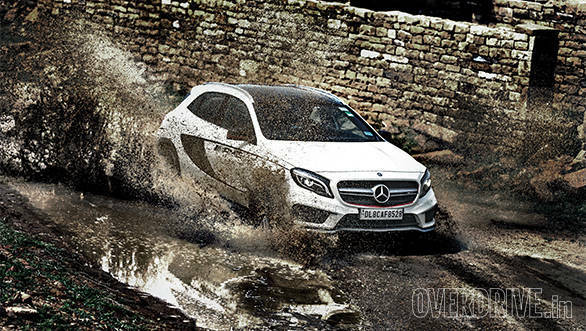 The GLA felt like an MMA fighter, all pumped up before a fight  it simply did not want to ease off. The car was on edge, steering never quite settling and 7-speed dual clutch gearbox ready to drop a couple of cogs at the slightest prod of the throttle. But as we approached the Sam dunes outside of Jaisalmer, the road got interesting with a gentle weave and continuous climbs and drops. My finger subconsciously moved to the little button next to the gear selector to select Sport mode. Instantly, the GLA feels like it's been stabbed through the heart with a shot of pure adrenaline. The engine gets even angrier, revs darting to the 3,000rpm mark where they're no longer shackled by lag from that big turbo. The throttle sharpens and the gearbox gets snappier, dispatching shift after shift with addictive bang from the exhaust. Thankfully, the suspension is non adjustable  the GLA is sporty enough. It was an immersive few miles, I'll give the GLA that. But after the adrenaline wore off, I was glad to see Shumi in the RS 7 pull over for some photography. The AMG had worn me out, I just wanted to settle into a gentle cruise but the car was laughing it off. 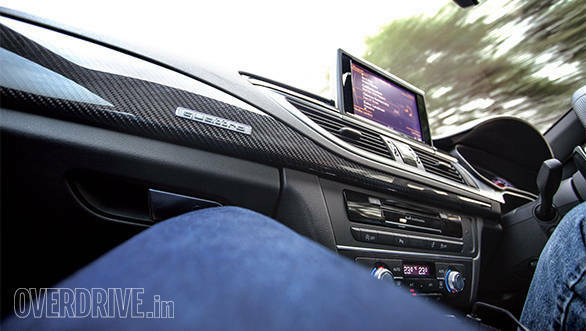 Shumi sauntered over from the RS 7 smiling and said, "This Audi is a fantastic machine." That's a lot coming from a man who's notorious for his opinion that four wheels are two too many. He once returned from Japan having driven the Lexus LFA and all he had to say to us excited lot was, "Yeah, it sounds nice." A Lexus LFA for heaven's sake! But Shumi was genuinely impressed. "Get rid of those stupid wheels and it's a seriously good car." After Ishaan had his fill of pictures at the breathtaking Sam dunes, and after we convinced all the camel ride sellers that we really didn't want to safari through the desert, it was time for lunch. It took a while to find some, as the locals simply couldn't fathom why we fancy folk in our flashy cars wanted to eat their simple food. 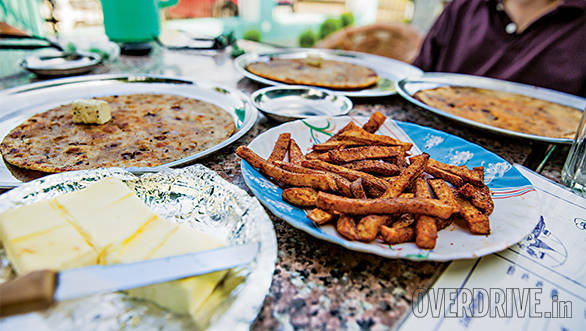 Convincing them was worth the effort and we found ourselves sitting with the locals on charpoys outside a small dhaba. That was some of the best daal and vegetables I've ever reluctantly agreed to eat. 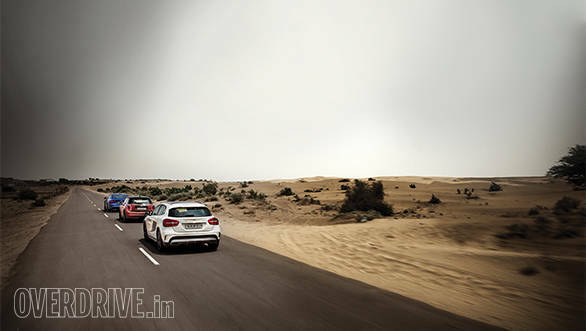 Fast cars give you the luxury of time so on the way back to Jaisalmer, we decided to turn off and take a 5km detour to the infamous haunted town of Kuldhara. There are plenty of versions, but the story we heard sounds pretty credible and goes like this. Kuldhara was one of 84 villages inhabited by Paliwal Brahmins. One day, Salim Singh, the diwan of the area, who doesn't seem to be a very likeable chap, happened to pass by and took a fancy to one of the elder's daughters. He insisted that he had to have this girl and that the elders should marry them or he would kidnap her. The elders of all 84 villages convened that night and decided that since he was going to have his way no matter what, their only recourse was to abandon the villages and leave. That very night, all 84 villages were abandoned and a curse was placed on the land by the old and disabled who had to be left behind  if they couldn't make this a hospitable land, no one would either. It was a story worth fifty bucks, and since it came from a little boy we met at the village, it had to be true. For a village that was abandoned 400 years ago, Kuldhara is incredibly well-planned and the stone ruins don't look more than a few decades old. A mud path runs through the site, and at the insistence of the friendly security guards, we inched the three cars in. The Audi and Mini could only go so far, but in the GLA we were able to explore a little further thanks to the extra ground clearance. Splashing through the puddles left behind from rain the previous night, I was sorely tempted to turn traction control off and go into rally mode. But that isn't right in a place with so much history. Any incident would haunt me forever. It did get me thinking. What an incredible machine the GLA would have been if it was a bit softer, and more absorptive. The Audi and Mini need to crawl over every bump to protect their low underbellies but the GLA has to go just as slow to save its passengers' spines. Which pretty much defeats the purpose of being an SUV. 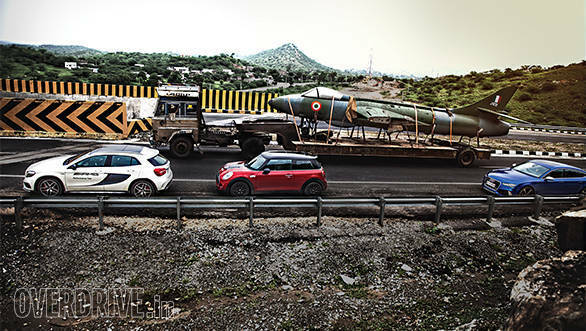 Outside Kuldhara, it was time to take the Mini from Rahul, now officially the world's luckiest intern. After the seriousness of the Germans, the little Mini was such a breath of fresh air. I've never driven a car with more personality, something increasingly hard to find as cars evolve. Fat by Mini standards, the new Cooper is tiny in this company and its tall windows and near vertical curved windscreen offer excellent visibility and a unique driving perspective. The tension of managing a big, expensive car never occurs in the Mini. Neither do any worries about 190PS hot hatch not being able to keep up  200kmph passes with ease and its fast six-speed automatic makes sure the front wheels are entertainingly overwhelmed with power in the first two gears. 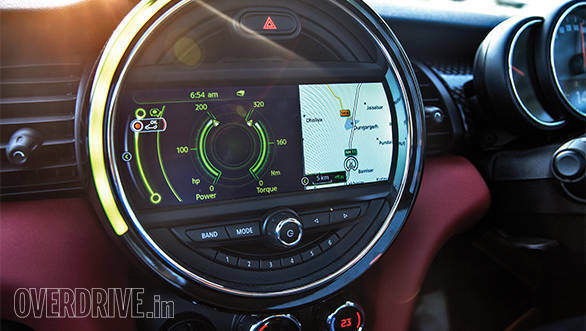 For less than Rs 40 lakh on-road Delhi, the Cooper S makes for a phenomenal price to fun ratio. There's also the fact that it's nearly 300kg and 750kg lighter than the bigger two Germans. It's not exactly what you'd call calm though. The steering gently twitches over camber changes and is so direct, that for the first few kilometres you end up making much stronger steering inputs than planned. There's so much grip over the front end, that it reminds of a motorcycle. The sensation of agility is compounded by that short wheelbase which gives the impression of the rear wanting to break free in corners  it never actually happens. 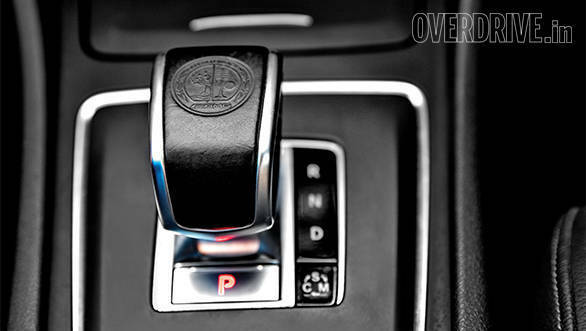 But my absolute favourite thing is the handbrake  I've never used one that works better. The Mini simply wants to slide everywhere and there's enough power going to the front wheels to allow you to carry it quite long . See a round-about? "Let's skid around it!" U-turn? "Oh, can we please use the handbrake?" It's like a hyperactive adolescent Labrador, its big eyes begging you to throw that stick (in this case, yank the handbrake) again and again and again. I love it! 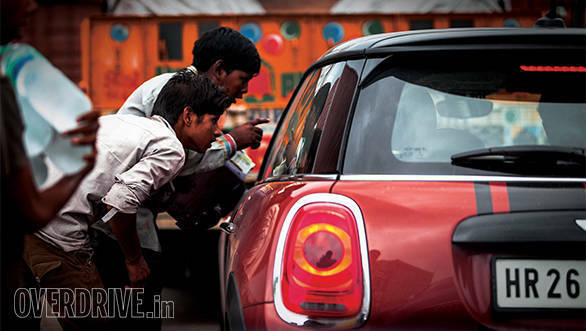 I'm not the only one  Ishaan, our young photographer has the attention span of a six-year old and he adored the Mini's cabin. Its detailed operating system, multiple gizmos and funky programmable mood lighting kept him occupied for hours. Shumi seemed to be the only one who wasn't besotted, calling it too much work. Then again, the Mini is aimed at the younger man. The old Cooper S was a similar firecracker but when the excitement wore off, it became a hard and unforgiving machine. The car was no fun after you were done having fun. That's where the new one is so much better  it has the ability to cruise, and on these stock sized 16-inch wheels, the ride is pretty decent too. Its cabin is quieter than the AMG's, which allows you to appreciate the optional Harman Kardon system's crisp and powerful beats. Aside from the cramped rear, this is actually a lovely cabin. The remainder of the day was spent driving to Bikaner, another easy one. We were fresh and it was hard to believe we'd covered over 700km in a day. I was happy being in the Mini as we navigated our way to Jaswant Bhawan, a quaint and peaceful hideaway in the bustling heart of Bikaner. The other two were mired in traffic while the Mini made quick work of the chaos, impatiently waiting for them to catch up. Screw it, I'll drive all three. Starting with the Mini. 2018 Audi Sportscar Experience: Fast, fun! An RS 7, a Mini Cooper S, a GLA 45 AMG. . . An RS 7, a Mini Cooper S, a GLA 45 AMG. . .